relic hunters, researchers, and historians. Vol. 41 No. 1 of the magazine is now available! Civil War Metal Detecting Seminar & Hunt - April 2 - 5, 2019. Email seminar@nstcivilwar.com for additional information. 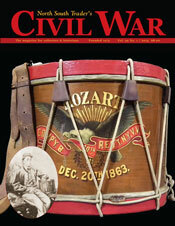 Call 540-672-4845 Mon.-Fri. 9-5 or email orders@nstcivilwar.com. 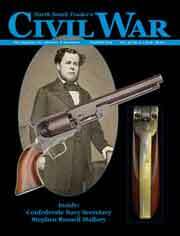 Welcome to the award-winning North South Trader's Civil War magazine, the first and finest periodical dedicated to collectors, relic hunters, historians, and researchers of the War Between the States. 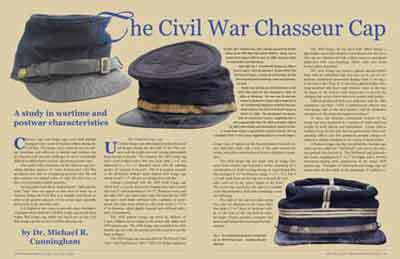 Since 1973 we have celebrated the Civil War artifact as a contextual, tangible document of history. We have published well over 1,000 articles focusing on every type of relic that exists, from minie balls to uniforms to gunboats. 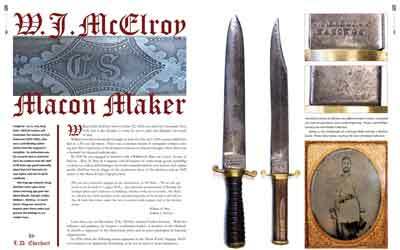 The artifact is our niche, and whether brought home as a war trophy by a veteran, preserved by descendants, stored in a museum, housed at a historical society, or excavated from the soil, all have important places within our pages. We have been active in historic preservation since our first issue, and we are proud of the fact that we were in the vanguard of publicizing the crucial fight against rampant development of the primary relic: the battlefield. 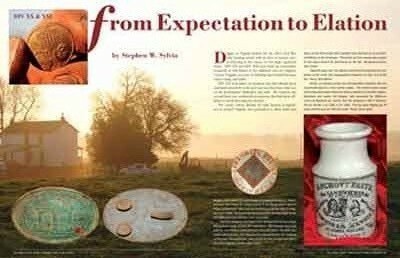 Long before ARPA ever existed, we were the first to publish the ethics and etiquette of Civil War relic hunting, including but not limited to obtaining permission for private property and never encroaching on protected lands. 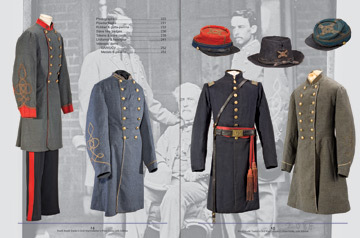 Please join us as we continue to investigate Civil War history through the untold stories of its artifacts. 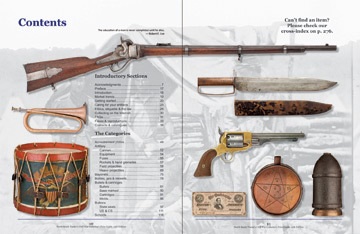 You can complete your set of North South Trader's Civil War from the comfort of your home with our online list of available back issues. You can browse the inventory or check for article titles and authors by using the Search function above. Find out what you've been missing, and get it from the source! Issues in volumes 1 through 20 are pictured by volumes. Issues in volumes 21 through 40 are shown individually. When back-issue images are shown in groups of six, they represent the entire volume. They are shown, left to right, top row, issues 1, 2, and 3; bottom row, left to right, issues 4, 5, and 6. Purchase prices shown are for single copies only. Feel free to inquire about discounts for multi-issue purchases. and the Autumn Gettysburg Show every October. See our calendar for these and more events for collectors. 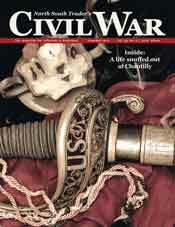 Several times each year we hold Civil War Metal Detecting Seminars where each participant gets a new metal detector, detector specific training, detecting gear, a reference library, a subscription to our magazine, and a one-day detecting trip to a Civil War site. Our Seminar arrangements also include lodging & all meals. To be added to our seminar information list, please email seminar@nstcivilwar.com. along with antiques and collectibles to satisfy a diverse range of interests. Convenient online shopping at jsmosby.com. 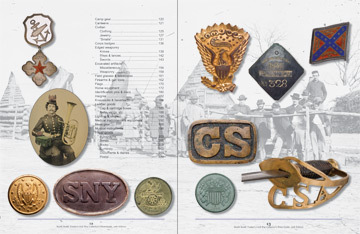 As the fluctuating market dictates, we publish the official Civil War Collector's Price Guide. Our current edition is the 12th. This 300 pg. 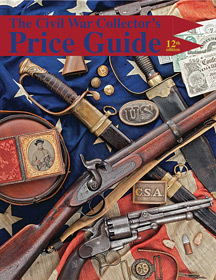 edition of The Civil War Collector's Price Guide features not only updated values but also 700 black-and-white images, numerous full-color pages, scores upon scores of new listings, and even an all-new category. 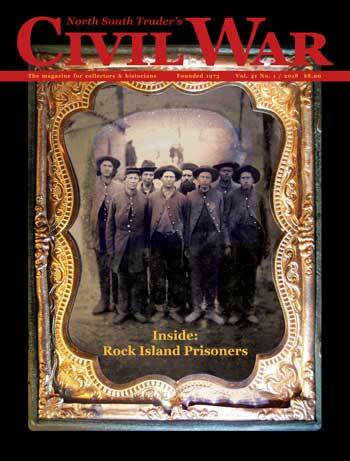 Please call 540-672-4845 during business hours to order your copy or simply order online. (Click on Catalog > Books > Price Guide.) $39.95 + $6.65 shipping, priority mail. Top image is a closeup of the haunting eyes of an unidentified Confederate, courtesy the Liljenquist Family Collection, Library of Congress Prints and Photographs. Don't miss an online visit to this stunning collection of Northern and Southern soldiers.